The first season entails playing all positions in the team including the position of the owner, head coach, and the general manager. This will help you to develop more skills and get you more involved. However, you will need to bring in replacements for some positions and take up the role of a coach and manager. After some time, you won’t play any role in the team apart from flying the world in a corporate jet but still owning the team. Your ultimate goal will be to step back and watch your wholesale real estate team as it run itself. Attracting new talents and training them continuously will be another goal. That’s because you want to replace yourself with new talents. Don’t forget that the strength and weakness of every player will affect the performance of your real estate wholesaling team. Therefore, bring only the most skilled and best professionals onto your team. Building a wholesale real estate team takes time. You also must be ready to replace weaker players if you feel that they are not your best choice. Don’t fear firing people if they can’t meet your expectations. But, bear in mind the fact that even the best players falter occasionally. Hold every team member accountable when it comes to performance bearing in mind that weaker players put your team at risk. Therefore, keep an eye on them and don’t forget that it’s you who is on the line. That’s because you’re responsible for all aspects of your wholesale business. You need to know members of your real estate wholesaling team and their roles. Building an wholesale real estate office requires you to learn being comfortable with the idea of managing people. Since not all entrepreneurs are ready to manage people, you might need skills to do it. Nevertheless, some entrepreneurs are leaders by nature and managing people is easy for them. For your real estate business to succeed, you have to find, interview, train and motivate employees. Not everybody will fit in your business. Therefore, scour your area to find the right people. You also have to remove bad prospects so that you can find people that fit in the model of your business. After hiring, evaluate them continually while removing people that slow down the progress of your wholesale business. A simple concept that you should learn is leveraging other people’s skills. Fortune 500 companies have been built on the basis of this principle. It’s a straightforward concept- when you pay employees X dollars, their efforts ought to increase the bottom line of your company by X+Y. For instance, if you pay an employee $36,000 every year, their effort should bring your company at least $36,000 more. Thus, you should have a way of measuring the contribution of an employee to the bottom line of your business. Some investors into real estate wholesaling are scared by the idea of paying people between $36,000 and $60,000 per year. To avoid being scared, think about it this way: You don’t put this amount at risk. You invest it into your business and you can fire the employee anytime if they don’t meet your expectations. Don’t forget that without leverage, you can’t grow your wholesale real estate business and to achieve growth you need to take risks. Consider the talent that a person brings to your wholesale real estate team. Make sure that they can perform tasks that nobody else in your business can perform. First employees will perform different tasks in the company. However, when you hire new employees, there will be changes in job responsibilities. Additionally, don’t rush into hiring employees to avoid hiring people that don’t add value to your business. Initially, you will lose money because some new employees will need training. That means you’ll commit money and time in employees training. Don’t be tempted to hire more employees because you think your company is growing. This tendency is natural but it can be a trap if you are not careful. Remember that your monthly overhead will grow thereby growing the earning pressure. This can eventually become overwhelming if a close eye is not kept on it. To grow your wholesale real estate team, you must balance every position and act. Your business should need a person rather than want them. Fill positions that you KNOW they will increase revenue rather than positions you THINK they will increase revenue. Use an accounting system to run your business. This will enable you to track expenses and monitor business growth. Quick Growth - Quick growth leads to hiring team members quickly which leads to paying more money every month. Confusion can also arise when the business is unable to distinguish job responsibilities for new employees. Incomplete Job Descriptions - Confusion arises in the office due to incomplete job descriptions. Changing Roles - The role of the wholesale real estate business owner changes as they assign roles to new employees. Riskier Transactions - As the business grows, the number of transactions handled simultaneously increases. This is also the case for the amount transacted every month. To avoid these problems, it’s imperative to know the members of your wholesale real estate team and their responsibilities. Make sure that they have the right personality characteristics & real estate skills we went over previously. Additionally, set the right pay scale for each team member to ensure their motivation without over stretching monthly expenses! 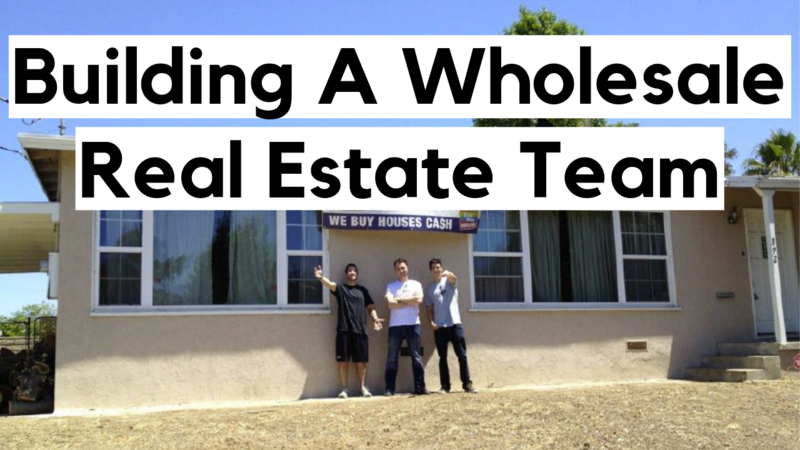 Do these things and you will begin to build your successful wholesale real estate team!